Sugar cookies are definitely one of my favorite treats. Not so much the type that are hard and crunchy with royal icing – but the ones that are super soft with a thick layer of creamy frosting. And sprinkles of course. Because my 5th birthday is coming up. 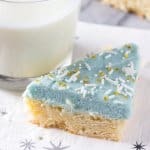 Now – I absolutely love Soft-Batch Frosted Sugar Cookies and Sugar Cookie Bars (for when I’m feeling lazy…). But sometimes you want something a little extra special. Something with a little more visual intrigue. Something that appeals to your chocolate-loving side. 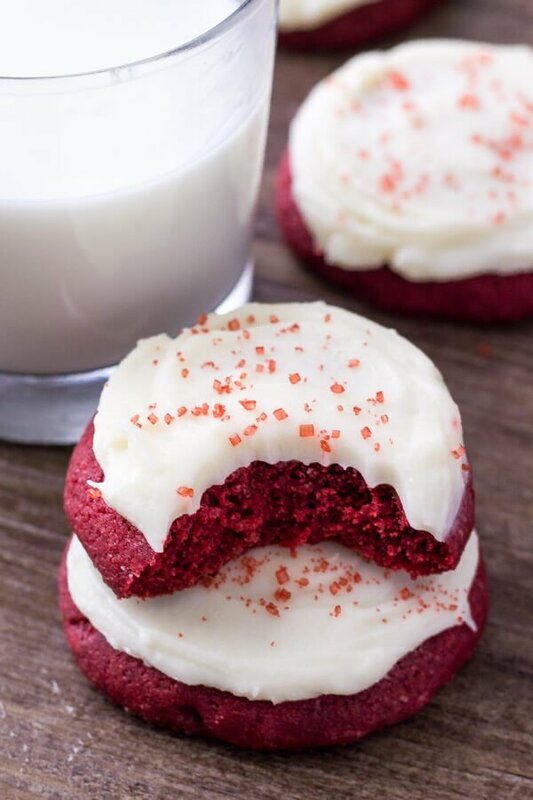 Enter – Red Velvet Cookies with Cream Cheese Frosting. 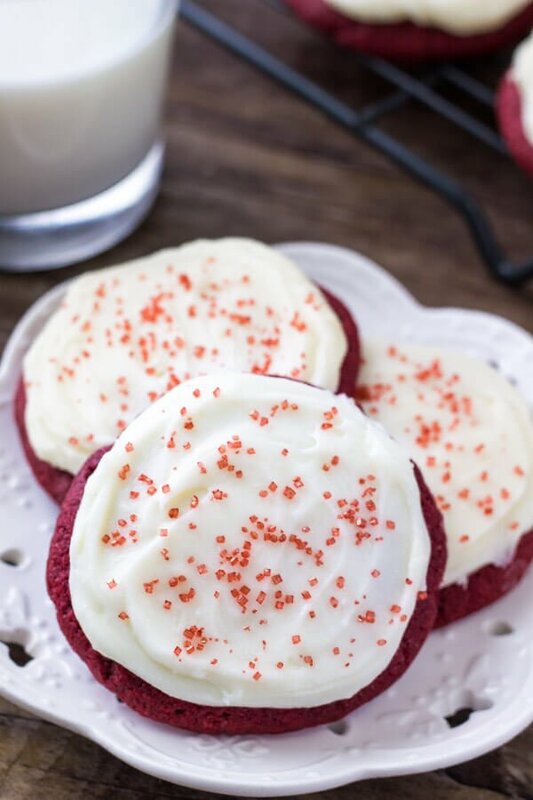 They’re Lofthouse style red velvet sugar cookies that are perfectly soft. 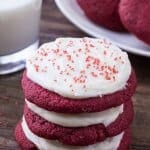 Then they have a delicious hint of chocolate, beautiful red color and tangy cream cheese frosting that screams red velvet. If you want to get straight to the list of ingredients and instructions, you can Jump to Recipe below. But I’m including lots of details on what makes these cookies sooo amazing and all my cookie making tips. To make our cookies super soft, there’s a few key ingredients. First, we’re using a combination of butter and shortening. Butter adds flavor, then the shortening keep the cookies extra soft. 1 egg and 1 egg white. The eggs make the cookies tender, and the extra egg white makes them delicate. 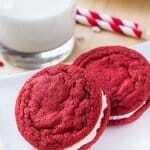 Then cake flour make the cookies soft, melt-in-your mouth and perfectly delicate. 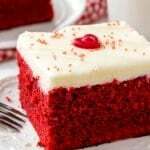 Finally, a little vinegar gives the classic red velvet taste. For the beautiful red color, I used gel food coloring. I’d start off with 2 teaspoons, then add up to 1 extra teaspoon if you prefer a more vibrant color. I added 3 whole teaspoons (also known as 1 tablespoon) for the vibrant color pictured – but that’s up to you. 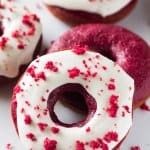 You can also use liquid food coloring too. Then it’s time to chill the dough. This is absolutely necessary for thick, puffy, pillow soft cookies. When you’re ready to bake, form the dough into balls about 2 – 2.5 tablespoons in size. I like to use a cookie scoop for this. Then flatten them down slightly using either your palm or the bottom of a glass and you’re ready to bake. You can also make jumbo cookies by using a large cookie scoop instead, and making balls about 3.5 tablespoons in size. They’ll be ginormous, and bake for about 12 minutes. And now onto the cream cheese frosting. It’s creamy. It’s tangy. It’s thick. 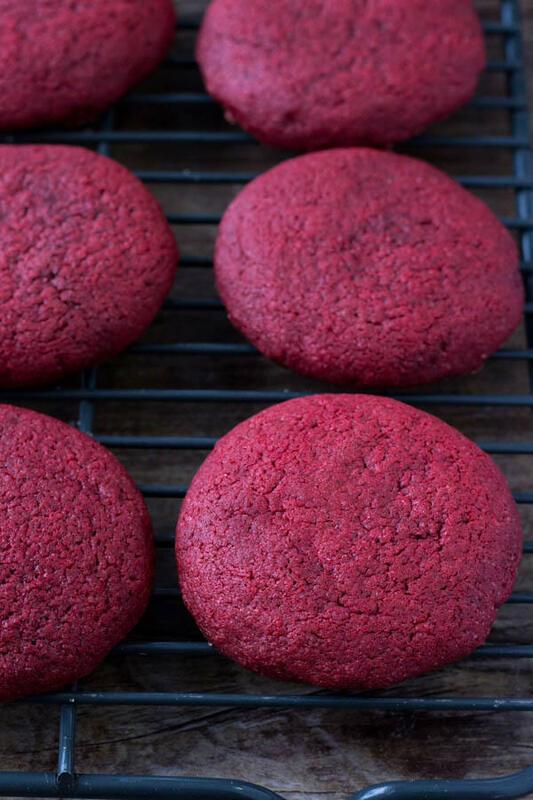 And tastes absolutely amazing with these red velvet cookies. Obviously – if you’re looking to make super intricate designs, royal icing is the way to go. 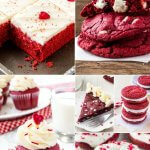 But if you’re looking for delicious cream cheese frosting that you can slather on in enormous quantities…. then look no further. 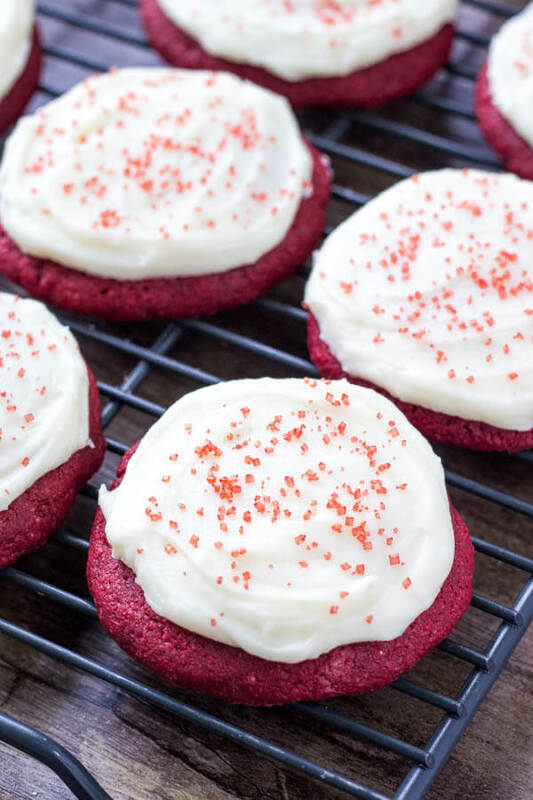 These red velvet cookies with cream cheese frosting are the perfect Lofthouse style sugar cookie that are thick, pillowy soft and slathered with cream cheese frosting. 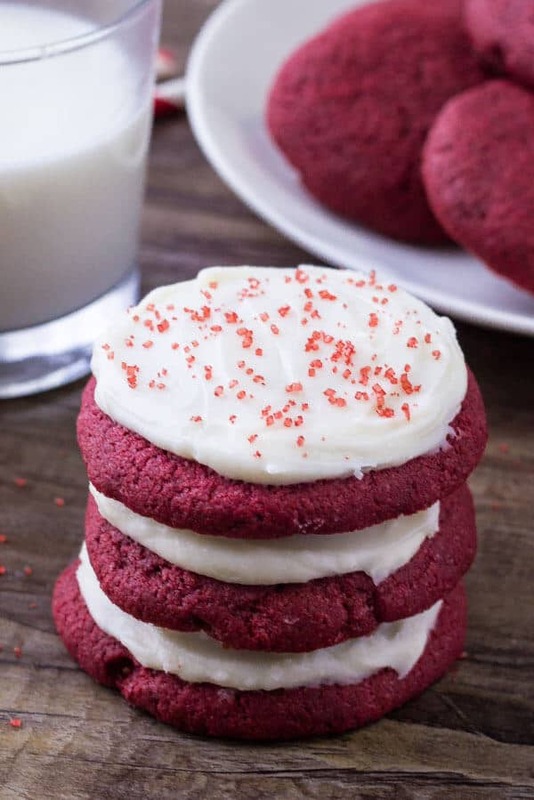 They’re perfect for Christmas or Valentine’s Day, and if you love red velvet – then these cookies are definitely for you. In a medium bowl whisk together the flour, cocoa, baking powder and salt. In a large bowl beat together the butter, shortening and sugar until fluffy. Beat in the egg, egg white, vanilla, red food coloring and vinegar. With the mixer on low speed, slowly beat in the flour mixture about 1/2 at a time. Cover the bowl with clingfilm and refrigerate for at least 2 hours or overnight. Form the dough into balls about 2 tablespoons in size and place 2 inches apart on the cookie sheets. Flatten slightly with your palm or the bottom of a glass dipped in flour. Bake for 8-10 minutes or until the tops are just set. In a large bowl beat together the cream cheese and butter. Slowly beat in the powdered sugar about 1 cup at a time, then beat in the whipping cream as needed. Frost the cooled cookies with knife and decorate with sprinkles. *If you don't have cake flour, measure out 2 1/2 cups all-purpose flour. Then remove 1/3 cup of all-purpose flour and add 1/3 cup cornstarch. Sift the mixture 2 times.